ISTiOSELIDA - Sailing ONLY: Επανεμφανίστηκε το Alinghi!!! Alinghi begins an exciting new journey in the 2011 Extreme Sailing Series this weekend with the first event of the championship taking place in Oman. The Swiss team, back on the X40 multihulls after an absence of two years following their victorious 2008 campaign, is embarking on this new adventure with the ambition to consistently compete at the very highest level throughout the season against a line-up composed of eleven other top international teams.The team’s new recruit, Frenchman Yann Guichard, will be at the helm for this first event alongside three other multihull experts: Tanguy Cariou (skipper), Detrey (bowman) and Nils Frei (trimmer). "We are fully focussed as a team ahead of this first race of the new season”, said Guichard, whose experience in the Extreme Sailing Series in previous years will certainly be an added addition to Alinghi. "We have been training very well over the past few weeks and now we feel excited about testing our skills against the opposition and finding out what level we are at. I am thrilled to have accepted this new challenge with Alinghi and I’m really eager for the competition to get started. We believe that this team has the potential to get some great results." 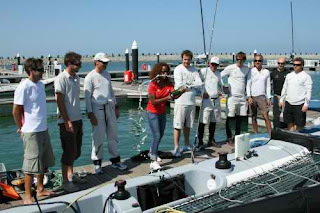 The Oman racing program consists of five days of competitive sailing (from February 20 to 24), with different racing formats that range from fleet-racing in open water, to match-racing on short courses very close to the shores and to the public.